I had picked CrossLoop while back for my family PC setup and had several opportunities to test it since (naturally :). It is most convenient remote support tool I had used so far. CrossLoop is actually bundle of two applications. CrossLoop itself acts as wrapper for open source TightVNC. Former handles settings and connection process, latter remote access itself. Interface is very friendly, especially comparing to native mess of TightVNC. To establish connection party (who wants to be accessed) must provide special access code and choose to connect. Then other party uses that code to start session. CrossLoop acts both as client and server, so it is same software for both sides. Not really a flaw, but by design CrossLoop requires human presence on both sides. That makes it more secure and ensures that party being accessed is only in session when it is deliberately requested. Still I’d like to have something as easy to use, but with option of remote access to unattended computers. I also encountered weird issue I wasn’t able to fix yet – on my home PC alphabet part of keyboard doesn’t work on remote computer. It is exactly same with stand-alone TightVNC so not CrossLoop’s fault, but still annoying. 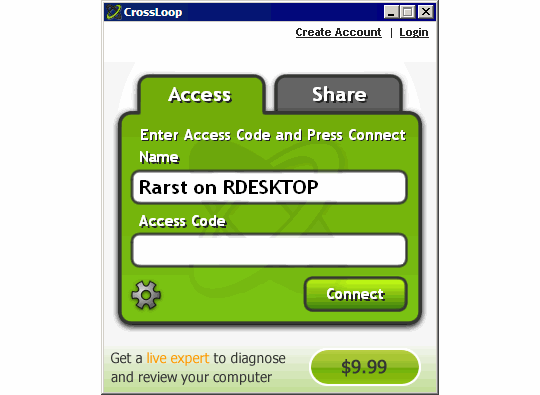 Aside from regular use CrossLoop also maintains portal that lets people to hire helpers for their computer issues. I have no feedback on this, but just might dive in some day – concept seems appealing and software itself is polished enough to not get in the way. Interface also displays text add for such services. It will still ask to agree with TOS on first run, but skipping setup saves plenty of seconds and clicks. Convenient and with zero learning curve app is perfect for home use when both sides are attended. Been meaning to try this out for a while. I’ve been using UVNC, but since 105 I run into a lot of issues with it so I went back to 102. My primary use for a remote software is to access unattended systems on my local network, mainly IDS sensors and virtual server hosts. Good call on the human presence, saved me some time. I will however try this out is some tech support sessions. Beats having them flip on their ps3 cam and point it at the monitor in a chat session, although in desperate situations it works. Any thoughts on a good replacement for UVNC? I’m going to check out tightvnc but wondered if you had any other suggestions? Main things I want are the ability to control an unattended system, encryption and open source. Not to worried about it being complicated because I’ll be the only one that’ll be using it. Good post and thanks in advance. I like TightVNC for use inside home LAN. Over Internet it lacks traffic encryption. There are plenty of tutorials how to wrap it with SSH, but overkill for my needs. As possible alternatives there is newish TigerVNC project http://tigervnc.org/ It is fork of TightVNC by people who got tired of slow development pace. Hadn’t got to it myself, status is still beta but 1.0 was released in August. Hi! I use Radmin for helpdesk in LAN. Crossloop is not bad for remote access over Internet. Radmin is nice (I have that at work) but it isn’t compatible with generic VNC and is shareware. I see little reason to use it except some specific advanced functions are needed. TightVNC part is free (GPL), CrossLoop itself is proprietary freeware. Connectivity is quite mean, I was able to make it work even through port 80 http proxy. It is flexible so for more open connections it will go directly and for more closed it will be routed through CrossLoop servers. Encryption is 128 bit Blowfish at endpoints. CrossLoop is and was a great product. However like everything else, they have gone from a free product to a service charge product for more advanced features like file transfers. It used to be that file transferring was just part of the interface, now they charge a premium for this capability. Well it was great while it lasted. Still a useful product if you are trying to help out a friend, family member or co-worker with a computer problem. I have been using it for at least a couple of years now and it really is pretty slick. Thanks for heads up hadn’t notice file transfer removed from free version. I don’t use it much in CrossLoop anyway, speeds are often terrible. Luckily there are many ways to conveniently transfer files. So as long as CrossLoop gets remote control right it will have its niche.